Have you ever wondered what it's really like being 'out there'?﻿ What it's like to cruise long distances to far away places? Can it really be that different than the daysailing and local cruising we do near our home ports? You need only ask for a few salty stories from veteran bluewater cruisers to get the answers. The following story is one I recently first read on one of my favorite blogs, Sailing Wondertime. The crew of s/v Wondertime (Michael, Sara and their two young daughters) started their adventure across the Pacific in Seattle and are currently enroute from the tiny island nation of Niue to Tonga and eventually New Zealand. I've greatly enjoyed following their journey and being treated to a glimpse of what my own family, complete with three young daughters, might experience if we're fortunate enough to sail the South Pacific someday. 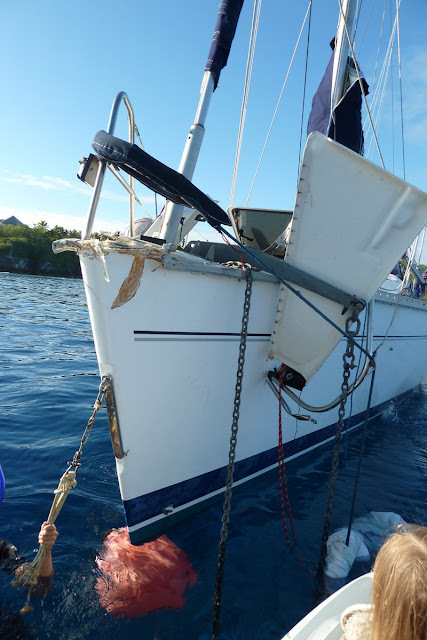 The crew aboard Wondertime recently blogged about an incident involving one of their harbor neighbors on Niue. The harbor is too deep for anchoring, so a mooring field has been installed and visiting boats can tie up to a mooring ball for safe holding. Apparently, whale sightings close to the mooring field in Niue's harbor are commonplace, but it's the whale that wasn't sighted on August 13 that's the focus of this story. The crew of the sailing vessel Knotty Lady was ashore having dinner when witnesses on neighboring sailboats said they hear a loud bang and saw Knotty Lady moving about as if being propelled by her motor. The sea was calm, the wind was still and there were no other boats moving in the harbor at the time. When Knotty Lady's crew returned, they found their anchor roller, bow cleats, port side bow rail and anchor locker hatch had all been torn off the boat. The best theory that the local cruising community and native Niueans came up with was that a whale had become tangled in Knotty Lady's mooring line and thrashed wildly and powerfully enough to free itself, but not without significant collarteral damage to the sailboat. Fortunately the weather conditions were mild and the loose anchor chain fouled on a coral head, preventing Knotty Lady from drifting away. I suspect the culprit was probably a humpback whale. The timing of the event in August overlaps with the humpback migration to Niue for calving from July through October. As if the magnificent breaches and fluke slaps of these leviathans wasn't awe inspiring enough, take a moment to consider the damage inflicted on a 20,500 pound sailboat in a matter of minutes. Ever experience that in your home port? You can read the full account of the story and follow the repairs in the words of Knotty Lady's crew here. As a footnote to this story, reading a firsthand account of this story on a blog instead of regurgitated through the editorial eyes of some magazine or newspaper is what I love about the new age of social media. I still think tweeting is for the birds and facebook is for the teenagers, but I'm clearly smitten with the blogosphere. Hey. I'm the Owner of Knotty Lady along with my partner Nikki. This certainly was an experience. But thanks to the help of the the Niue Yacht Club and other yachties in the area, especially our good friends from Wondertime. We were able to get enough supplies and help to do the repair right there in the mooring field at Alofi. Thanks Dennis! I'm glad you were able to get your boat repaired and that no one was hurt. You've got an amazing story to share.